This document has its own uF discussion thread. 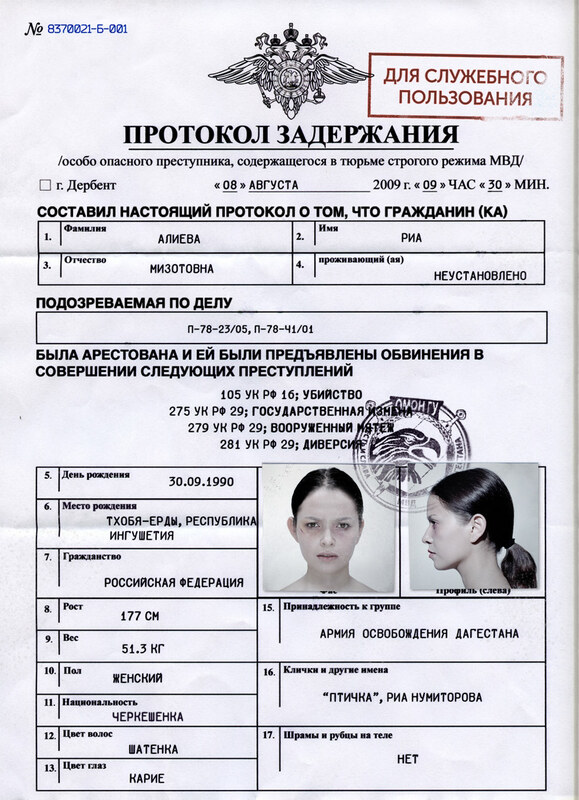 Ria Aliyev is the main accomplice in the terrorist attack on a checkpoint near OMON Dzhalgan Sabnova, Derbent, Dagestan, which she committed 06.08.2009 together with faith and Oksana Gamidova Kareeva. This act of terrorism by the Islamist group, "Dagestan Liberation Army" claimed the lives of two OMON soldiers of the Republic of Dagestan, Corporal Marat Stepanov and Private Oleg Kamenev. 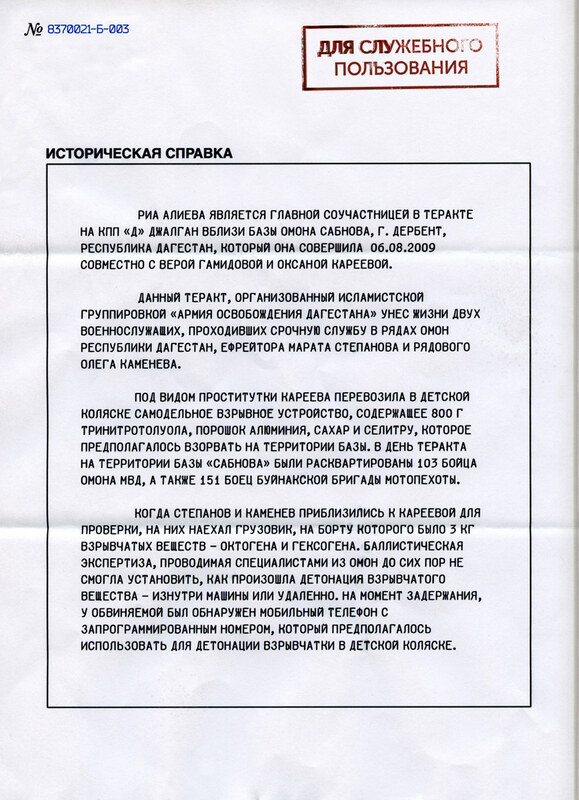 When Stepanov and Kamenev approached Kareeva, a truck carrying 3 kg of explosives - HMX and RDX - was driven onto them. A ballistic examination conducted by OMON experts still has not been able to establish whether or not the explosives were detonated remotely. At time of arrest, the accused was carrying a cell phone with a programmed number that was to be used to detonate the explosives in the baby carriage. The remains of Gamidova, Stepanova and Kamenev were collected at the crime scene. 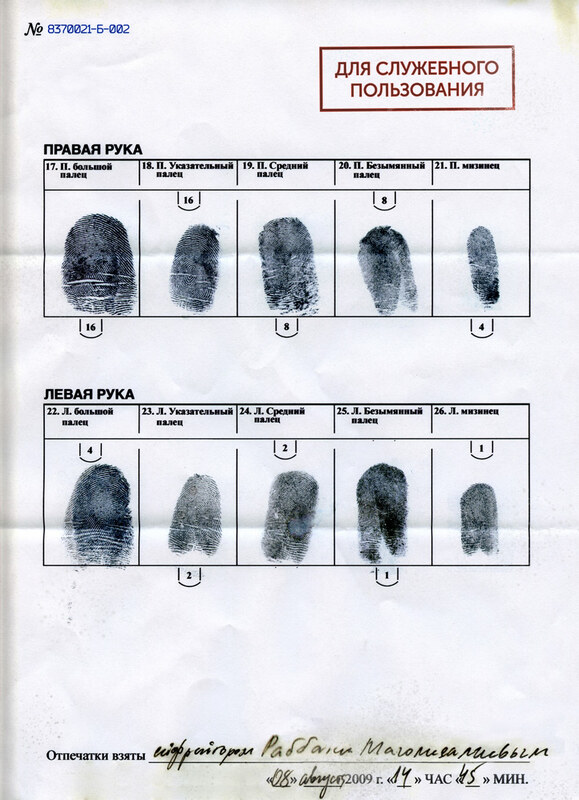 They will undergo a forensic examination in JSC (Joint Stock Company) Alfa-Tsentr as part of a joint investigation by the Interior Ministry and the FSB. As the remains of the second woman have not yet been found, it is assumed that the third suspect, Oksana Kareeva, managed to escape. Urgent transfer to the intermountain valley on request of the FSB. Do not question these orders. Control of the operation including transport is delegated solely to JSC Alfa-Tsentr. This page lists the charges against Rhea and provides a wealth of biographical information about her. Possibly the most interesting piece is her birthplace, Tkhaba-Yerdy, Ingushetia. Tkhaba-Yerdy is not a region, but the ruins of the largest medieval Christian church in Ingushetia, constructed in the 8th or 9th century. This is oddly specific for a birth location. It also contradicts the biographical information from the MoT Dubai Video, which and an old tweet from Vera that suggested the Junsui were born at Kosvinsky Mountain. New name, Rabbani Magametov. We also now have Rhea's fingerprints on file. This is an abbreviated account of the attempted bombing of the Derbent checkpoint. It more or less matches the narrative provided by Rhea toward the end of Rhea's Confession. The account very specifically mentions the composition of both Oksana's carriage bomb and the explosives onboard the vehicle. The ingredients TNT, aluminum powder, sugar and saltpeter are exactly the same as those claimed by Russian authorities to have been used in the Russian Apartment Bombings. RDX, or hexogen, is military/industrial explosive alleged by many to have been used in the Russian Apartment Bombings by Russian security services as part of a false flag attack to justify the Second Chechen War and help Vladimir Putin consolidate power. See here for more information on bomb composition similarities. 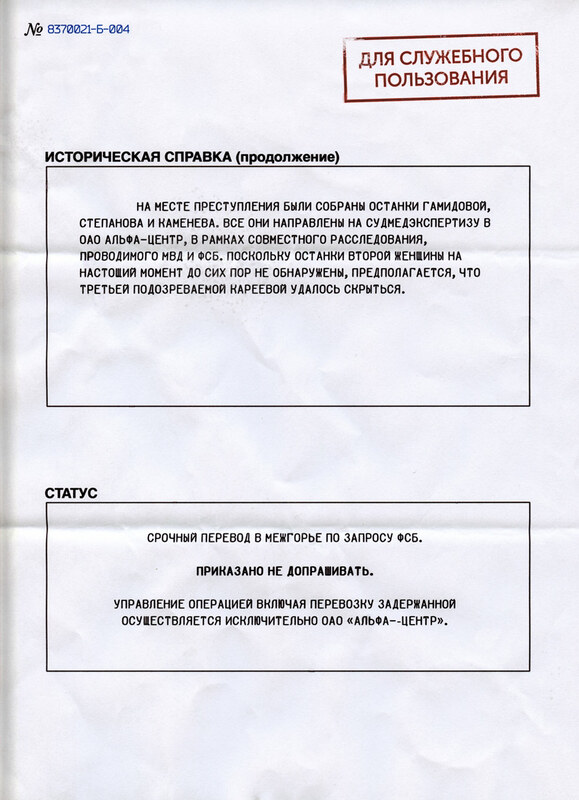 From this page we learned that Oksana escaped, but her subsequent whereabouts are unknown. We also learn that this bombing was investigated by Alfa-Tsentr, the Russian Interior Ministry, and the FSB. The end of this page is a transfer order to move Rhea to the 'intermountain valley'. This is probably the transfer order that sent her to the Mount Yamantau, where we discovered the camera feed of her in her cell a few days later.